You are here: Home / Architects / So I’m in Arkansas…. Surprise! – I wasn’t planning on being in Arkansas but here I am. I have some unexpected business to take care of but luckily for me, I have a sister who lives in Fayetteville I so I get to spend time with her and her family (4 kids!). My business will only tie me up for the afternoon on Tuesday so I will be spending time looking around and exploring some of the local architecture (I hope they have an old brew house…). 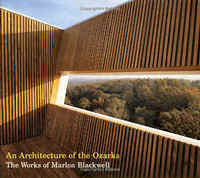 Another exciting benefit to this trip is I will get to spend some time with award winning architect Marlon Blackwell on Wednesday. I originally met Marlon for the first time some 9 or 10 years ago when he came through Dallas and visited with a college friend of his – and my employer at time – Michael Malone. Marlon spent the day with us and we drove him around and showed him some of the projects we were currently working on. I gave Michael a call this last Sunday to see if he would do me the huge courtesy of calling Marlon to see if he had time for me to visit. I remember Marlon being generous and easy-going and Michael assures me that he is still the same – I am really looking forward to the visit. I will post photos and any interesting bits from conversations later in the week. My good friend Michael is no slouch either and has recently written a book based on his lecture, “So you wanna do houses?” – one of the AIA conventions most popular. The book “The Architect’s Guide to Residential Design” is published by McGraw Hll and while originally geared towards architects looking to break into the residential market, this is a hands-on working manual that is proving to be a valuable resource to architects and owners alike who are looking to gain a better understanding of the intricacies of various methodologies involved in the process of creating a residence. There are several real-world case studies used in the book to illustrate typical residential design issues. This is a fantastic book and should be on the desk of every architect who practices in the residential market. So, this should be an exciting week as I will also get to practice with my new digital camera (Nikon D90). Hopefully my learning curve will be swift and I will be able to get some great photos from my trip and of Marlon’s work. Where will I be in 20 Years? The Best Architect in Dallas?